Unigraphics NX, also known as Siemens NX, is an advanced software package used for engineering analysis, design and manufacturing finished design with the help of machining modules. NIEDS is a renowned Unigraphics NX CAD Training Institute In Delhi. Our course is designed in such a way that you will easily learn all the commands and the important tools of the software. It will take you from a stage of knowing nothing about NX to a stage where you will hold all the relevant skills and knowledge to become a certified NX designer. Our Unigraphics CAD Modules will make you well-versed with the little and big details of this powerful tool. Get in touch with us to know more.
. How To Start NX ?
. Studying Different Environment In NX.
. Setting Work Area Colour Scheme.
. Introduction To Dialog Boxes.
. To Sketch And Modify Different Entities.
. Zooming And Panning Sketches.
. Invoking The Assembly ModuleUsing Selection Methods.
. Adding Geometric And Dimensional Constraints To Sketches.
. Measuring Distance Between Sketched Entities.
. Concept Of Solid Modeling.
. Use Of Datum Planes, Datum Axis And Datum Points.
. Creating Different Features On Base Module.
. Approaches Of Assembly Drawing.
. Applying Assembly Constraints To Components.
. Checking Interference, Clearance And Analyzing.
. Understanding Sheet Metal Environment.
. 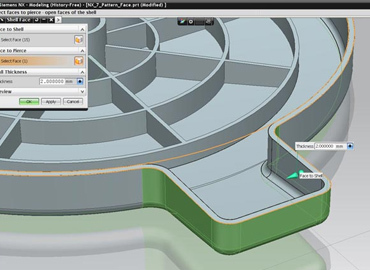 Applying Extrude And Revolved Feature.
. Creating A Surface Using Through Curve Tools.
. Creating N Sided Surface.
. Creating Curves From Bodies.
. Creating Feature Like Dart, Embossing, Face Blend, Fillet Bridge.
. Invoking The Different Templates In Drawing.
. Applying Section View Like Full, Half, Revolved, Break-Out Sections.
. Manipulating The Drawing View.
. Generating Parts List And Associative Balloons In An Assembly.
. Printing And Potting Options.
. Finding Out The Core And Cavity For Any Component.